I'd LOVE to give you my personal review of Griffon, the world's tallest dive coaster. But as you may remember from reading my Busch Gardens main page, roller coasters are "verboten" for me. Never fear: I can pass along this review. 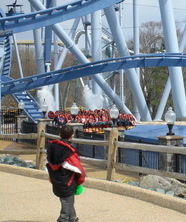 Three writers from the Daily Press tested the Griffon, which shoots riders up 205 feet and plunges them down 90 degree at a speed of 75 mph. Ratings were based on a scale of 1 (lowest) to 5 (highest). They also gave it a thumbs up or down on whether it's worth waiting in line for a second try. Clearly, Griffon has a serious scream factor, so much that one reporter's rating completely blew the scale. Diving straight down at 75 mph can do that to you! They recommend that people hang on to glasses, loose shoes, and anything else that might go flying off! 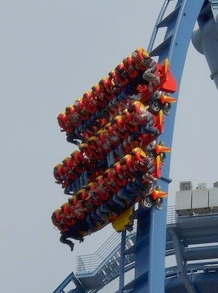 Do you dare ride Griffon? One reporter said "my knees were like Silly Putty." Another said "I could hardly walk after we got back to the station. But I couldn't wait to ride again." My favorite comment: "No need for a chiropractor here." Apparently the seats are so well-padded and you're so well-strapped in that there's little fear of anything vital getting jerked around. And the ride sounds smooth, smooth, smooth. Is Griffon at Busch Garden worth a second wait in line? They agreed that it depends on the line. If you're there on a Saturday afternoon, forget it-- it's not worth another 2-hour wait for a 2-minute ride. But if you're there on a mid-week evening? Go for it! Griffon ends with you splashing down on your back in the water. Notice the picture on the right. We were there on a cool day, so we didn't want to get wet. But if it's a hot day and you feel like cooling off without going on Griffon, just stand at the railing next to where Griffon touches down. You may not get completely soaked, but you will get wet! Admission Deals - Current admission info plus deals like Fun Cards, and the free Preschool Pass. Don't miss the limited time 2-Park fun Card deal! Single-Day Ticket Discounts - A DOZEN or more ways to save! Here's where you get on and off Griffon. Busch Gardens/Hotel Package Deals Are they good or bad? We'll give you the straight scoop. How to Go Straight From Roller coasters to a Luxurious Massage... A review by a very satisfied customer after her day at the Kingsmill Spa. For information on how to get a map for your phone, click here.